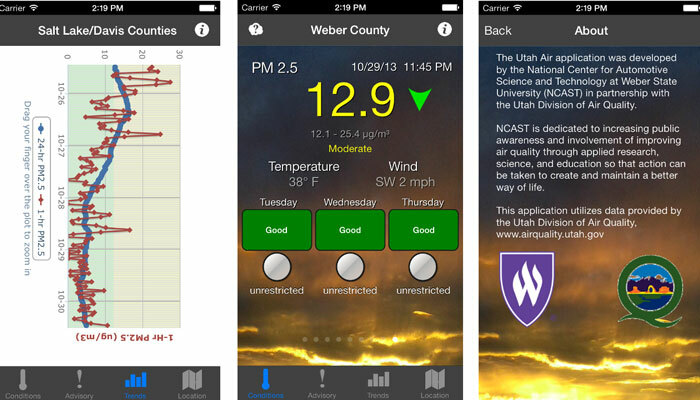 The Utah Air application employs the Utah Division of Air Quality’s air quality alert system, which consists of action alerts represented by three symbols that signify limitations on solid fuel emissions for the public (e.g., carpooling, wood burning) based on guidance from the EPA’s Air Quality Index (AQI), which determines how daily pollution levels will affect people with various health conditions. Utah residents can check the app daily to know when not to use wood and coal burning stoves or fireplaces, the best times to exercise outdoors or when to make one consolidated trip for errands based on conditions and trends. The three-day forecast can help users plan ahead to adjust travel plans or work schedules and avoid adding harmful emissions to the air during winter inversions and the summer ozone season.